WBJEE JECA 2018 Result declared online on 23 July 2018. WBJEE JECA 2018 exam was conducted on 23 June 2018. 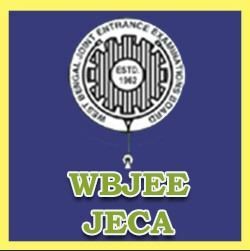 WBJEE JECA 2018 is an entrance exam that is conducted by West Bengal Joint Entrance Examinations Board (WBJEEB) for admission in various institutions in West Bengal to Master of Computer Application (MCA) course. The exam for WBJEE JECA 2018 is an objective type and OMR based where multiple choice questions are asked. There are 150 questions with each question holding 1 mark and are to be completed within a span of 3 hours. For more information related to WBJEE JECA 2018, you can keep yourself updated using the link provided below. Latest Update - WBJEE JECA Result 2018 declared online on 23 July 2018. Link to check the result has been given below in this page. Candidates must have completed 3-years Bachelor Degree program from UGC recognized University with minimum 60% marks in Honours/Aggregate (45% for SC/ST candidates) or AICTE recognized BCA from any University/Institute with minimum 60% marks in Mathematics at the Bachelor’s level. Candidates must have passed in the secondary examination with minimum 60% marks and Higher Secondary or equivalent examination from recognized Board with minimum 60% marks in Mathematics at each level. Candidates must have passed Bachelor’s degree from UGC/AICTE recognized the institution of minimum 3-years duration except BBA, with Mathematics at 10+2 level or graduate level. They also have to obtain minimum 50% marks (45% marks for SC/ST/OBC-A/OBC-B candidates) at the graduation level. Candidates have to complete Graduation or equivalent degree program under (10+2+3) pattern in any discipline of a UGC recognized University/Institute or AICTE recognized B.E./B.Tech/BCA of a University/Institute. Candidate must have Mathematics as one of the subjects at each level of education. Candidates must have obtained minimum 60% marks (45% marks for SC/ST/OBC –A/OBC-B candidates) at each level. Candidates must have completed B.Sc. Honours degree program under (10+2+3) pattern in any discipline of a UGC recognized University/Institute with at least 60% marks in Hons./Aggregate (55% marks for SC/ST/OBC-A/OBC-B candidates) along with at least 60% marks in Mathematics. Candidates must have obtained minimum 60% marks in Secondary and Higher Secondary or equivalent level from recognized Boards with minimum 60% marks in Mathematics at each level. The application process of WBJEE JECA 2018 is conducted through online mode only. Candidates have to fill the online application form to appear in WBJEE JECA 2018 examination conducted on 23 June 2018. The application process started on 8 March 2018. Candidates can click on the link provided below and follow the steps mentioned to fill the WBJEE JECA 2018 online application form. The WBJEE JECA 2018 application form has to be submitted through the online mode only. After the successful submission of application form, the confirmation page will be displayed. Candidates should take a printout of the confirmation page and keep it safe till the completion of admission process. The WBJEE JECA 2018 Admit Card is issued by West Bengal Joint Entrance Examinations Board and can be downloaded online. The admit card was available from 13 June 2018 for WBJEE JECA 2018. Candidates have to carry the admit card in the examination centre otherwise they won't be allowed to appear in the exam. Candidates can click on the following link to download the WBJEE JECA 2018 Admit Card. The WBJEE JECA 2018 Result has been declared on 23 July 2018 online. The result is published in the form of Rank Cards, which contains all relevant ranks and total score. Candidates participating in WBJEE JECA 2018 can view and download their rank card by logging in with their password. As the result has now been declared, the counselling process will start. The selected candidates will be based on cut off rank and/or a cut-off score. Candidates can click on the following link to check the result and download the rank card for WBJEE JECA 2018. Each correct answer will yield 1 (one) mark. Incorrect correct will yield (-1/4) marks. For any combination of response with more than one option, the said answer will be treated as incorrect and will yield (-1/4) 25% negative marks. Less negative marks in Mathematics & Aptitude Test taken together. More positive marks in Mathematics. More positive marks in Aptitude Test. Less negative marks in Mathematics. Less negative marks in Aptitude Test. Institutions who are offering MCA program to the candidates follow different module of eligibility criteria for admission. The name of such institutions is displayed in the following table along with their modules. Candidates can scroll the page to view the list.